New students are always welcome at Three Rivers Martial Arts. We accept new students year round, there are no specific times when students have to begin taking classes. New karate students are invited to try out classes free of charge for one week before deciding if they would like to sign up for longer (See coupon at the bottom of this page). 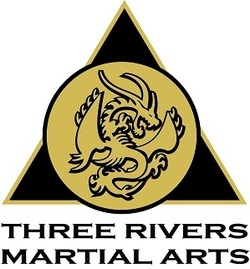 Anybody interested in trying out classes can call the karate school at 412-343-2900 or send an e-mail to threeriversmartialarts@ymail.com to set up a night when they would like to come in or you can just stop by anytime we are open. New students should wear a t-shirt and sweatpants or a similar comfortably fitting outfit for their first few classes. Once sometime decides to sign up, they can get the school uniform that students ordinarily wear to class. 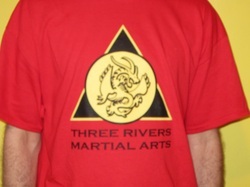 The uniforms at Three Rivers Martial Arts consist of a school t-shirt, a pair of martial arts pants, and a belt. The school t-shirts cost $15, the martial arts pants vary in cost depending on exactly what kind you purchase, and the white belt for new students is provided free of charge. 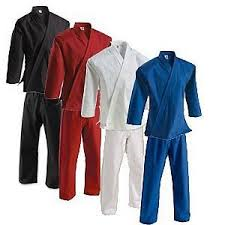 Most of the time, the martial arts pants need to be ordered and take about 1 week to come in. The school t-shirts and white belts are ordinarily in stock. Instead of a school t-shirt, a martial arts uniform top is also an acceptable top to wear during classes. If students are interested in wearing this instead of the t-shirts, they can be ordered. Here is an example of one of the karate school t-shirts. Here is an example of the uniforms we wear. Color belt students have to wear the white top and bottom. Black Belts can wear black pants along with a white top. Instructors can wear a black top with white pants. The t-shirts can be worn with any color pants.